STRETCHED:15 inches Face opening is sewn with ½ inch elastic. From top of head to bottom of apron: 19 inches.  Or Tumble dry, low heat.  Do not commercially dry clean. 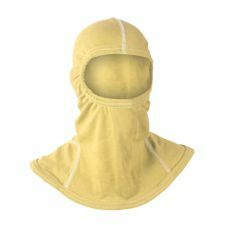  Do not store your hood in direct sunlight.